Starting with the most famous castle is Neuschwanstein Castle. This castle is located in Bavaria. The main reason for the castle being built was political. In 1866 Bavaria and Austria fought as allies and lost the war against Prussia. Because of this, Bavaria became obligated to accept a “defensive and offensive alliance”. This action removed the king’s right to control his army in case of war. From 1866, King Ludwig II was no longer the sovererign ruler. In 1867, because of this loss, King Ludwig started to make plans for his own kingdom by building castles and palaces where he felt he could be a real king. King Ludwig II had planned to rebuild the castle he had grown up in, “Hohenschwangau Castle.” It later was renamed “Neuschwanstein” after the death of King Ludwig II. It was suppose to resemble as close as possible the original style with all modern technical features added. “Neuschwanstein Castle” consisted of a gatehouse, a Bower, the Knight’s House, the citadel with two towers to the Western end. In 1867, King Ludwig II visited the reconstructed Wartburg Castle. This visit inspired him to have Eduard Riedel add new ideas based on stage sets designed by the Munich scene painter Christian Jank at the Wartburg Castle. Seven weeks after the death of King Ludwig II in 1886, “Neuschwastein” was opened to the public. This was ironic, as King Ludwigg II had built the new castle to be his private refuge from the public. Now “Neuschwanstein” had become open to the public. One, some people say is the most beautiful castle in Europe. 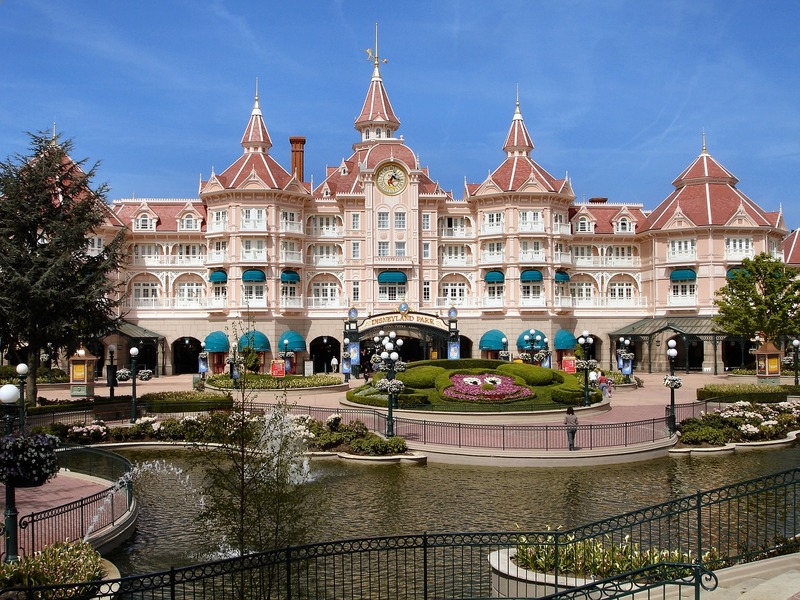 Nicknamed “the castle of the fairy-tale king”, nearly 1.3 million visitors toured the castle each year. In the summer, close to 6,000 visitors toured each day. Heidelberg Castle is second. It was first destroyed by Tilly’s troops in 1622. The castle was then rebuilt by Karl Ludwig. The castle was then destroyed a second time during the “War of Succession in 1693. The city of Heidelberg is located in western Germany. 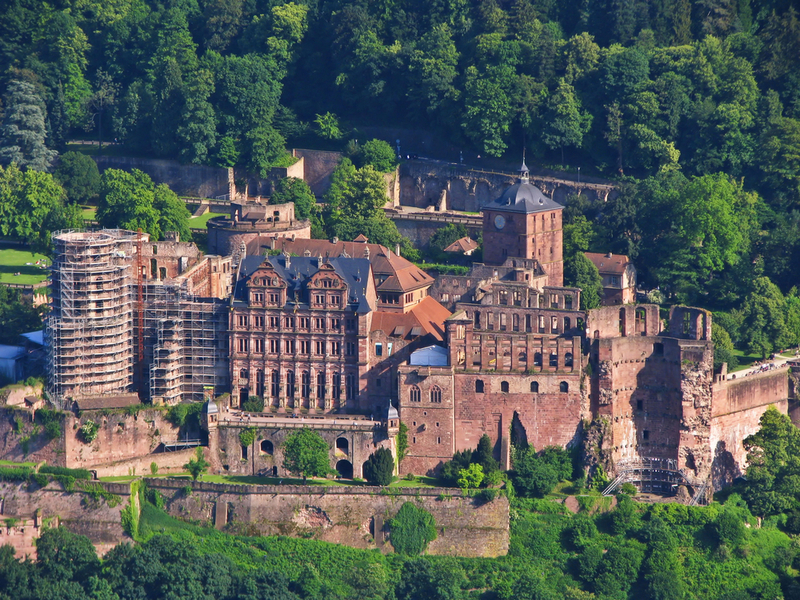 Heidelberg Castle was built during the 14th – 17th centuries. The castle is one of the most stunning historic landmarks of Germany. (Also called the red walled castle.) Heidelberg Castle although mostly in ruins has preserved many examples of medieval, Renaissance and Baroque German architecture. One prime example are the four granite columns located in the castle courtyard. These columns had be removed from a castle of Charlemagne’s. The castle had no uniform construction. The south and the west end style is plain Gothic structures. The north and east sections are made of massive stone walls in the Renaissance style palace and sculptures. The Otto Heinrich wing houses of the castle house a pharmaceutical museum. In the castle cellar is the famous Heidelberg Tun, a wine vat that has a capacity of 220,017 liters (58, 124 gallons) The current barrel was built in 1751 from 130 oak tree trunks. It measured 8.5 meters across x 7 meters high with a dance floor on top. The builder was Karl Theodor, a baroque plaque bears his initials. The intact rooms of Heidelberg Castle are beautifully decorated with ornate furniture and murals on the walls. The tour of Heidelberg Castle is well worth the trip. 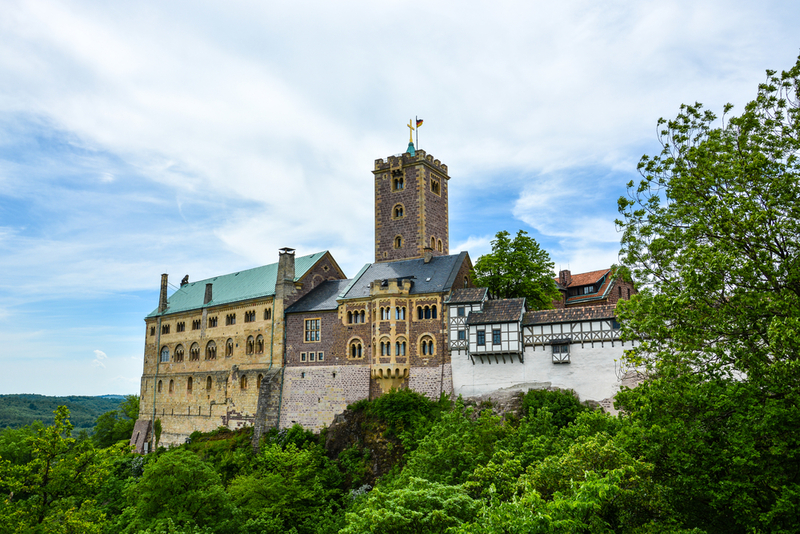 Wartburg Castle is third. It rest on a steep hill which shows a magnificent view of the city Eisenach. It is one of the oldest and best maintained Romanesque castles in Germany. The only way to enter the castle is by a draw bridge. The castle was built in 1067 and represents over 900 years of Germany history. There is a museum on the castle grounds that displays art masterpieces collected over centuries which include tapestries, medieval musical instruments and priceless silverware. The fourth castle is Castle Eltz. 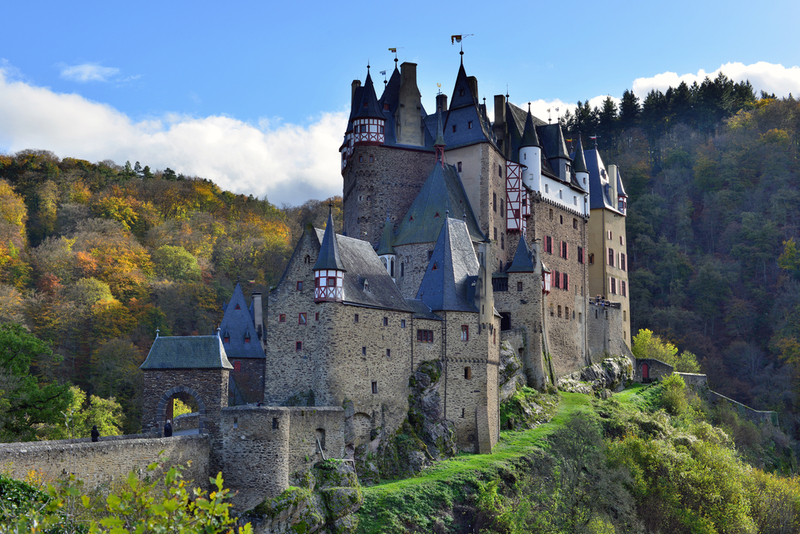 Castle Eltz was first built during the 9th to 13th centuries. The castle is positioned on a road that connected the Mosel River with the Eifel and Maifeld region. It was constructed in a symmetrical form that towered about 70 metres above the Eltz River as a fortress in 1268. Three generations lived in the castle which was divided into separate sections of the castle for each generation to live in. This made Eltz Castle known as a “Ganerbenburg” (castle of joint heirs). The castle remains in it’s original condition. Eltz Castle was involved in one feud from 1331-1336, when an ambitious Elector Baldwin of Trier tried to take over the castle. The lords and free knights of Eltz resisted and won. Eltz Castle is near one of the oldest cities in Germany, Trier, which is also worth the visit. Eltz Castle has remained in the possession of the same family for the last 800 years. 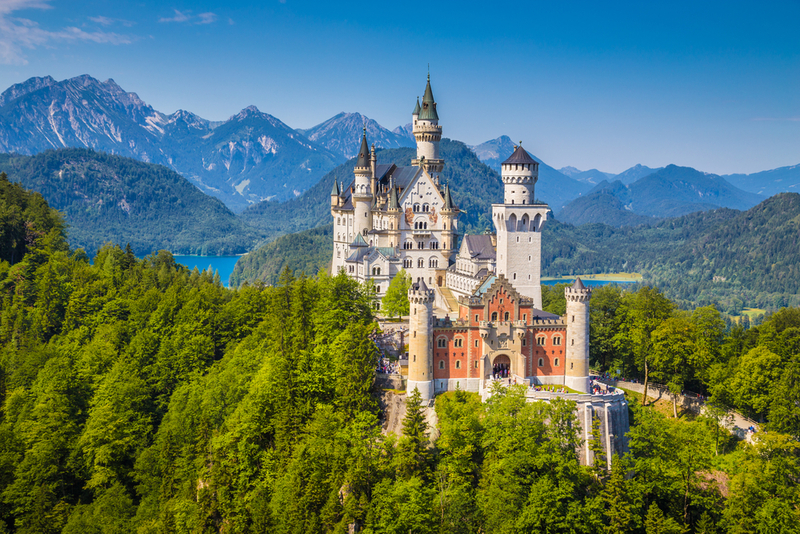 These are the four of the most famous castles in Germany. There are still many more to see as you go on a castle hunting tour.